Wmvcore.dll errors are caused by situations that lead to the removal or corruption of the wmvcore DLL file. In some cases, wmvcore.dll errors could indicate a registry problem, a virus or malware issue, or even a hardware failure. This application failed to start because wmvcore.dll was not found. Re-installing the application may fix this problem. The file wmvcore.dll is missing. Cannot start [APPLICATION]. A required component is missing: wmvcore.dll. Please install [APPLICATION] again. Wmvcore.dll error messages might appear while using or installing certain programs, when Windows starts or shuts down, or maybe even during a Windows installation. The context of the wmvcore.dll error is an important piece of information that will be helpful while solving the problem. 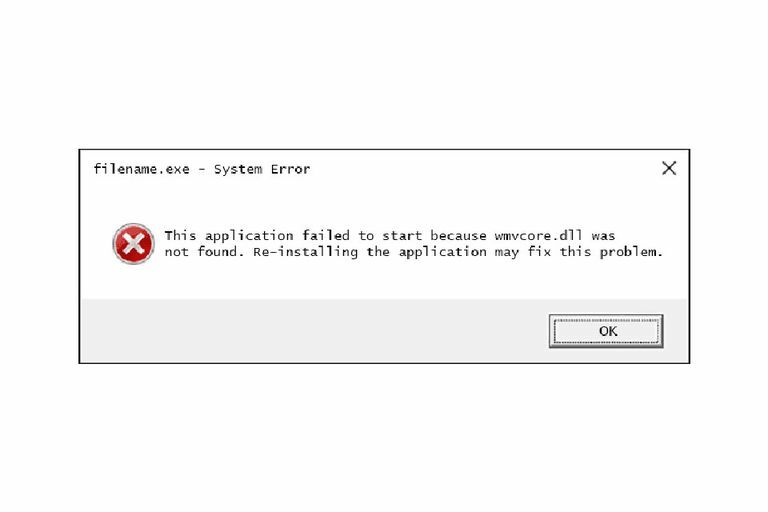 The wmvcore.dll error message could apply to any program or system that might utilize the file on any of Microsoft's operating systems including Windows 10, Windows 8, Windows 7, Windows Vista, Windows XP, and Windows 2000. Do not download wmvcore.dll from a "DLL download" website. There are many reasons why downloading a DLL file is a bad idea. If you need a copy of wmvcore.dll, it's best to obtain it from its original, legitimate source. Start Windows in Safe Mode to complete any of the following steps if you're unable to access Windows normally due to the wmvcore.dll error. Restore wmvcore.dll from the Recycle Bin. The easiest possible cause of a "missing" wmvcore.dll file is that you've mistakenly deleted it. If you suspect that you've accidentally deleted wmvcore.dll but you've already emptied the Recycle Bin, you may be able to recover wmvcore.dll with a free file recovery program. Recovering a deleted copy of wmvcore.dll with a file recovery program is a smart idea only if you're confident you've deleted the file yourself and that it was working properly before you did that. Install Windows Media Player, which is the source of the wmvcore.dll file. The best way to do this if you're using Windows 10 is to install Media Feature Pack from Microsoft. Windows 8 users should use this link, 8.1 this one, and this one for Windows 7. See How to Tell If You Have Windows 64-bit or 32-bit if you're not sure which link to choose for your version of Windows. However, if Windows 10 isn't fully updated, you'll need to download the Media Feature Pack version that works on your specific Windows build. To do that, first check which version of Windows you're running with the winver command through the Run dialog box (Windows Key + R), and then download the correct file from Microsoft that pertains to your version of Windows 10. For example, if through the winver command, you find that you have Windows 10 version 1703 Build 15063, you'd want to use the Media Feature Pack download link next to that version. Some editions of Windows do not include Windows Media Player by default even though some third-party programs require some of its components, like the wmvcore.dll file. Installing Windows Media Player or the Media Feature Pack will add the DLL file to the computer and give other programs access to it, which will likely solve the DLL problem. If you're using a Windows Server OS, the Turn windows features on or off Control Panel applet is where you can go to install the necessary Windows Media Player libraries. In there, choose Features > Add Features and then select Desktop Experience. Confirm any prompts and follow through with the setup wizard to complete the Windows Media Player install. Try your best to complete this step. Installing the program that provides the wmvcore.dll file, if possible, is a likely solution to this DLL error. Run a virus/malware scan of your entire system. Some wmvcore.dll errors could be related to a virus or other malware infection on your computer that has damaged the DLL file. It's even possible that the wmvcore.dll error you're seeing is related to a hostile program that's masquerading as the file. Use System Restore to undo recent system changes. If you suspect that the wmvcore.dll error was caused by a change made to an important file or configuration, a System Restore could solve the problem. Update the drivers for hardware devices that might be related to wmvcore.dll. If, for example, you're receiving a "The file wmvcore.dll is missing" error when you play a 3D video game, try updating the drivers for your video card. The wmvcore.dll file may or may not be related to video cards - this was just an example. The key here is to pay very close attention to the context of the error and troubleshoot accordingly. Roll back a driver to a previously installed version if wmvcore.dll errors began after updating a particular hardware device's driver. Run the sfc /scannow System File Checker command to replace a missing or corrupt copy of the wmvcore.dll file. Since this DLL file is provided by Microsoft in some versions of Windows, the System File Checker tool should restore it in those Windows editions. Install any available Windows updates. Many service packs and other patches replace or update some of the hundreds of Microsoft distributed DLL files on your computer. The wmvcore.dll file could be included in one of those updates. Test your memory and then test your hard drive. I've left the majority of hardware troubleshooting to the last step, but your computer's memory and hard drive are easy to test and are the most likely components that might cause wmvcore.dll errors as they fail. Repair your installation of Windows. If the individual wmvcore.dll file troubleshooting advice above is unsuccessful, performing a startup repair or repair installation should restore all Windows DLL files to their working versions. Use a free registry cleaner to repair wmvcore.dll related issues in the registry. A free registry cleaner program may be able to help by removing invalid wmvcore.dll registry entries that might be causing the DLL error. Perform a clean installation of Windows. A clean install of Windows will erase everything from the hard drive and install a fresh copy of Windows. If none of the steps above correct the wmvcore.dll error, this should be your next course of action. All the information on your hard drive will be erased during a clean install. Make sure you've made the best attempt possible to fix the wmvcore.dll error using a troubleshooting step prior to this one. Troubleshoot for a hardware problem if any wmvcore.dll errors persist. After a clean install of Windows, your DLL problem can only be hardware related.